It&#x27;s out of season, but Daylilyjoy&#x27;s post about Clarendon made me think of my favorite blooms that I look forward to all year. Well, when we moved to Seattle, I finally had the garden conditions that made my dream a possibility. It took a couple of years to construct our courtyard, get the hardscaping complete and prep the soil. In a shady back corner, behind a beautiful Giant Weeping Sequoia that my wife and I bought to celebrate our 10th anniversary, we planted two blue poppies in early spring. Beginners luck on our side, the plants took root and flourished. 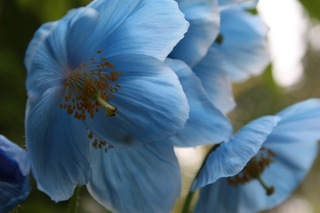 Each year, it comes back stronger and stronger sending up a handful of delicate, beautiful pale blue petals. I look forward to the show every year, going out in the garden at least once a day to say hi! Ah, dreams of spring already! Beautiful plant! I just love the light blue flowers! Wish we could grow those here!